This past week we celebrated the life of Martin Luther King Jr. a great civil rights activist that brought amazing change to our country. His holiday is a great time of year to reflect on the history of this country and how far we have come. 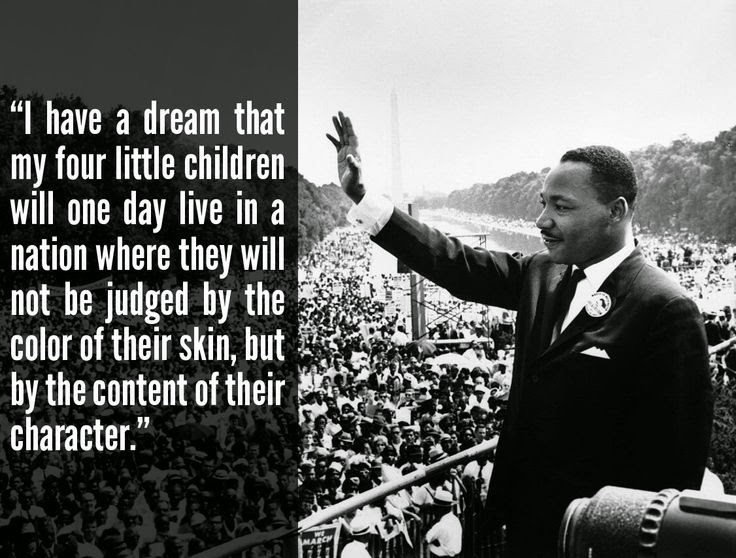 I like to remind my daughters of the many privileges that they have because of the sacrifices of people like Martin Luther King, Jr. The other day my daughter and I discussed what it must have been like to live during segregation/civil rights movement, to be judged and treated unfairly just because of your skin color. I told her that my parents and her great grandmother grew up here in Georgia during that time. We discussed what it must have been like to go to segregated schools. My grandmother was an elementary school teacher and taught during segregation and desegregation. Kennedy was surprised and wondered what it must have been like. We sat down and she decided to take her Barbie's back in time. As she played I asked her how she would feel if she was not allowed to go into certain places just because of the color of her skin, she said that she would be angry and sad. She said that people shouldn't judge or treat another person badly because of how they look or for any reason. She was glad that she did not live during that time and was grateful to all of the pioneers who made things better for her. We talked about how she should always be proud of who she is, even if someone treats her different because of how she looks or acts. I have been surprised many times during this last year that I have been a part of the Barbie Project. This was one of them for me, I didn't realize what a great tool her dolls have been to explore different topics and issues. I have really enjoyed taking a peek into her playtime, it has been very eye opening and entertaining at times. Last night I found my 16 year old down on the floor playing with her sister. We had been prom shopping earlier that day, and Barbie and all of her friends went shopping for dresses and went to the prom! Never too old for Barbie! We would love to hear ways that you have used your child's playtime as a teachable moment! Be sure to leave a comment on our blog, or on the Barbie Project webpage. Thanks everyone for taking the time to follow our journey during this project! This is part of a group of posts in partnership with #BarbieProject . All words and images are 100% organic and authentic.